Instagram/DesigndainKorean artist Dain Yoon paints ‘visual illusions’ on her own face and body. When Dain Yoon begins her next work of art, she’s locking in for upwards of 12 hours of painting on her own face and body. The Korean artist, who refers to herself as a “visual illusion artist,” is rapidly gaining fame for her Instagram photos and videos, which are at once confusing, trippy, and altogether very cool. At last count, Yoon had 307k Instagram followers. 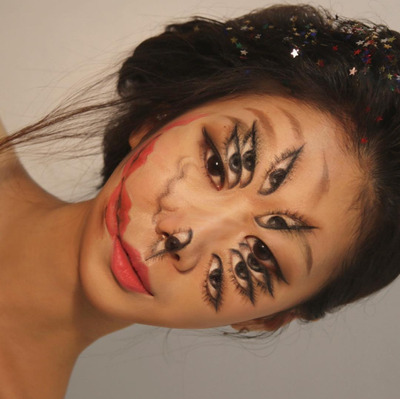 Yoon uses her face and hands to create optical illusions. At first glance, she’ll appear to have three hands or 10 eyes, but it’s all the work of some masterful painting and a lot of time and patience. Her drawings can take anywhere from three to 12 hours. This piece, titled 'Part of me' took longer, since Yoon painted the background and the teapot, as well as herself. 'Hours of painting through (a) mirror often makes me dizzy,' Yoon says.